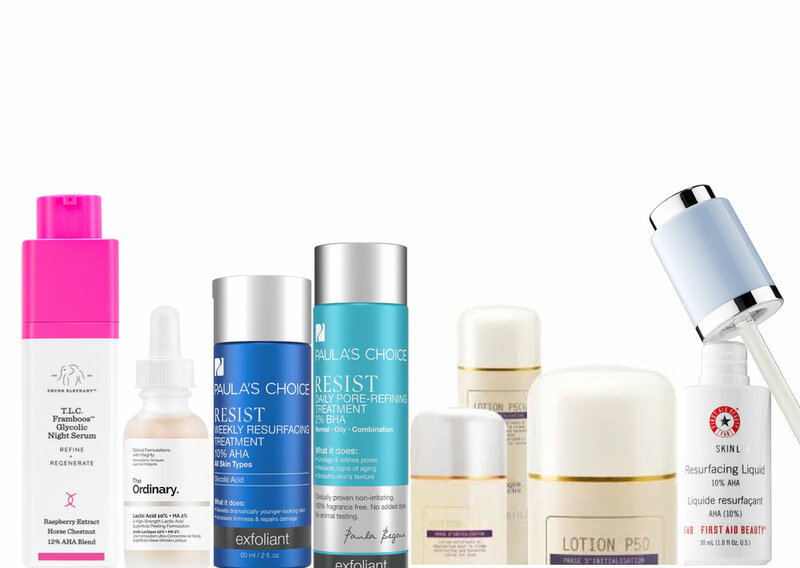 Resist Daily Pore Refining Treatment with 2% BHA: Water (Aqua), Dipropylene Glycol, Salicylic Acid, Pentylene Glycol, Butylene Glycol, Polysorbate 20, Palmitoyl Tripeptide-1, Palmitoyl Tetrapeptide-7, Dipotassium Glycyrrhizate, Nordihydroguaiaretic Acid, Oleanolic Acid, Sodium Hyaluronate, Allantoin, Trehalose, Panthenol, Glycerin, PEG-60 Almond Glycerides, Sodium Metabisulfite, PEG/PPG-18/4 Copolyme, Methyl Gluceth-20, Bis-PEG-18 Methyl Ether Dimethyl Silane, Glycereth-26, Sodium Hydroxide, Carbomer, Disodium EDTA, Caprylyl Glycol. BR has multiple p50 formulas and refers to their acids as "lotions" but they are liquid textures. These amazing formulas have achieved cult status for good reason, they use multiple forms of AHA acids and each formula has a multitude of beneficial ingredients targeted to specific concerns. I go through phases with using these because they do have a specific smell, and while it does eventually dissipate, sometimes I'm just overly sensitive to it. All but one of the formulas (the p50 Pigm 400) come in two versions: with phenol and without. I'm not a fan of the phenol formulas, there is too much risk vs reward and I would recommend the phenol free versions instead. I'll list the full ingredients lists below regardless. One of my favorite blogs has done a thorough explanation of phenol here. For those that always ask me why I don't carry BR at my office, I've tried contacting them many times LOL. BR does not advertise the exact percentages of each AHA acid used, but the ingredient list should give you a general idea of the strength, my assumption is they range from 5% to 12%. They also don't use the US FDA drug label for the inclusion of salicylic acid so it's possible the sal acid strength is below .5%. I will update this if I can find more information about the sal acid percentage. Anyway, here's a handy guide to the multiple versions of p50 available in the US. Lotion p50: Water (Aqua), Gluconolactone, Lactic Acid, Glycerin, Propylene Glycol, Niacinamide, Citric Acid, Ethoxydiglycol, Magnesium Chloride, Malic Acid, Vinegar (Acetum), Phytic Acid, Salicylic Acid, Cochlearia Armoracia (Horseradish) Root Extract, Arctium Lappa Root (Burdock Root) Extract, Rumex Acetosa Leaf Extract, Myrtus Communis Extract, Commiphora Myrrha Resin Extract, Allium Cepa (Onion) Bulb Extract, Thymus Vulgaris (Thyme) Flower/Leaf Oil, Sulfur, Sorbitol, Phenoxyethanol, Sodium Benzoate, Potassium Sorbate. Lotion p50V: Water (Aqua), Gluconolactone, Glycerin, Propylene Glycol, Niacinamide, Lactic Acid, Ethoxydiglycol, Vinegar (Acetum), Magnesium Chloride, Citric Acid, Malic Acid, Phytic Acid, Spongilla Lacustris Spicule Extract, Yeast Extract (Faex Extract), Cochlearia Armoracia (Horseradish) Root Extract, Capsicum Frutescens Fruit Extract, Juglans Regia (Walnut) Seed Extract, Arctium Lappa Root Extract, Sulfur, Sodium Salicylate, Salicylic Acid, Sorbitol, Phenoxyethanol, Sodium Metabisulfite, Sodium Benzoate. Lotion p50 W: Water (Aqua), Gluconolactone, Glycerin, Niacinamide, Propylene Glycol, Lactic Acid, Ethoxydiglycol, Magnesium Chloride, Malic Acid, Vinegar (Acetum), Phytic Acid, Citric Acid, Quillaja Saponaria Bark Extract, Cochlearia Armoracia (Horseradish) Root Extract, Arctium Lappa Root Extract, Capsicum Frutescens Fruit Extract, Arnica Montana Flower Extract, Sulfur, Allantoin, Sodium Salicylate, Serine, Urea, Sorbitol, TEA-Lactate, Sodium Lactate, Sodium Benzoate. Lotion p50 Pigm 400: Water (Aqua), Glycerin, Niacinamide, Sodium Gluconate, Lactic Acid, Sodium Lactate, Lactobacillus/Wasabia Japonica Root Ferment Extract, Magnesium Chloride, Mandelic Acid, Phytic Acid, Citric Acid, Gluconolactone, Magnesium Sulfate, Propylene Glycol, Palmaria Palmata Extract, Levulinic Acid, Salicylic Acid, Sodium Salicylate, Spiraea Ulmaria Extract, Vinegar (Acetum), Sodium Levulinate, Phenoxyethanol, Alcohol Denat., Microcitrus Australasica Fruit Extract, Prunus Persica (Peach) Leaf Extract, Potassium Sorbate, Sodium Benzoate, Ascorbic Acid, Pyrus Malus (Apple) Fruit Extract, Rubus Idaeus (Raspberry) Fruit Extract. Lotion p50 1970 (WITH PHENOL) Water (Aqua), Glycerin, Phenol, Niacinamide, Vinegar (Acetum), Ethoxydiglycol, Magnesium Chloride, Lactic Acid, Arctium Lappa Root (Burdock Root) Extract, Salicylic Acid, Sodium Benzoate, Sulfur. Water/Aqua/Eau, Glycolic Acid, Glycerin, Isononyl Isononanoate, Phenyl Trimethicone, Cyclomethicone, Cassia Angustifolia Seed Polysaccharide, Bis-Hydroxyethoxypropyl Dimethicone, C14-22 Alcohols, C12-20 Alkyl Glucoside, Butylene Glycol, Camellia Oleifera Leaf Extract, Punica Granatum Extract, Glycyrrhiza Glabra (Licorice) Root Extract, Anthemis Nobilis Flower Extract, Aloe Barbadensis Leaf Extract, Stevia Rebaudiana Leaf/Stem Extract, Sodium PCA, Urea, Trehalose, Polyquaternium-51, Sodium Hyaluronate, Xanthan Gum, Cetearyl Alcohol, Ceteareth-33, Mannitol, Cyclodextrin, Yeast Extract (Faex Extract), Disodium Succinate, Olea Europaea (Olive) Leaf Extract, Polysilicone-11, Lecithin, Polyacrylate-13, Polyisobutene, Polysorbate 20, Hexylene Glycol, Caprylyl Glycol, Triacetin, Ammonium Hydroxide, Disodium EDTA, Ethylhexylglycerin, Phenoxyethanol, Potassium Sorbet. Glossier makes some excellent makeup and skincare, and while I haven't tried everything in the line, I did really like the Milky Jelly Cleanser, the serums, and the masks. When I first took a look at the ingredients, it was great to see niacinamide, glycerin and aloe but surprising to see sodium hydroxide as the second ingredient as I hadn't seen it this high on an ingredient list before. Ingredient knowledge is part of my job, but I needed more resources and information about the science and chemistry behind how this potentially irritating ingredient can be used when combined with acids. I contacted two friends in the world of cosmetic chemistry and science to get more info and resources and my conclusion is that the irritation component is mostly, if not all neutralized. This formula isn't fragrance-free, and while I prefer fragrance free with acids - I don't feel the minimal amount is cause for concern unless you have highly reactive skin and in that case you probably aren't messing around with acids anyway. I used this for a few weeks with no irritation whatsoever, but my skin does better with a higher amount of BHA. This waterlight acid is a 10% acid combo of AHA (lactic and glycolic) and PHA (gluconolacctone) along with a tiny amount of BHA (.5% salicylic) making it good for normal to dry or slightly oily skin. pH 3.6-3.8 Active: Salicylic Acid 0.5%. Inactive: Water, Sodium Hydroxide, Lactic Acid, Glycolic Acid, Gluconolactone, Propanediol, Ethoxydiglycol, Magnesium Chloride, Glycereth-7 Trimethyl Ether, Niacinamide, Betaine, Inositol, Citric Acid, Glycerin, Phytic Acid, Pentylene Glycol, PEG-60 Hydrogenated Castor Oil, Caprylyl Glycol, Ethylhexylglycerin, Fragrance, PEG-8, Aloe Barbadensis Leaf Juice, Acetic Acid, Potassium Hydroxide. This brand keeps putting out some beautifully formulated products, I've repurchased the Daily Face cleanser many times! This is a frangrace free 10% AHA blend (Glycolic Acid, Malic Acid, Tartaric Acid, Lactic Acid) and dries quickly with a non-sticky smooth finish. This is a stand out formula for me due to the inclusion of so many skin soothers, ceramides and antioxidants. Great for all skin types, but acne prone may want to add in a BHA. pH 3.9 to 4 Water, Polysorbate 80, Glycolic Acid, Butylene Glycol, Caprylic/Capric Triglyceride, Sodium Hydroxide, Malic Acid, Tartaric Acid, Lactic Acid, Citrus Limon (Lemon) Peel Extract, Colloidal Oatmeal, Magnesium Ascorbyl Phosphate, Hydrolyzed Elastin, Papain, Hydrolyzed Hyaluronic Acid, Soluble Collagen, Avena Sativa (Oat) Kernel Extract, Triolein, Ceramide NP, Cucumis Sativus (Cucumber) Fruit Extract, Glycyrrhiza Glabra (Licorice) Root Extract, Morus Alba Bark Extract, Phytosteryl Canola Glycerides, Allantoin, Lecithin, Lysolecithin, Oleic Acid, Palmitic Acid, Maltodextrin, Aloe Barbadensis Leaf Juice, Glycerin, Tocopherol, Glycine Soja (Soybean) Oil, Caprylyl Glycol, Linoleic Acid, Sclerotium Gum, Xanthan Gum, Pullulan, Mica, Stearic Acid, Leuconostoc/Radish Root Ferment Filtrate, Silica, Phenoxyethanol, Chlorphenesin, Disodium EDTA. New product launches from the company behind the Ordinary (Deciem) get me excited! I recommend their retinoids and Vitamin C's often. You've probably heard about them by now, as their low prices make the products accessible to even the most budget conscious. I bought most of the line to try when they first launched and since there is a new Deciem store in my neighborhood, it's easy for me to go play with new products (looking forward to the upcoming mandelic acid solution). They have a good assortment of acids to choose from in multiple strengths along with a stronger at home peel. Glycolic Acid 7% Toning Solution. Some people do fine with fragrance and some don't. If fragrance doesn't bother your skin (this has a lot of rosewater) then this is a beautiful formula with humectants and antioxidants in a waterlight liquid. Great for normal to dry skin. pH 3.6 Aqua (Water), Glycolic Acid, Rosa damascena flower water, Centaurea cyanus flower water, Aloe Barbadensis Leaf Water, Propanediol, Glycerin, Triethanolamine, Aminomethyl Propanol, Panax Ginseng Root Extract, Tasmannia Lanceolata Fruit/Leaf Extract, Aspartic Acid, Alanine, Glycine, Serine, Valine, Isoleucine, Proline, Threonine, Histidine, Phenylalanine, Glutamic Acid, Arginine, PCA, Sodium PCA, Sodium Lactate, Fructose, Glucose, Sucrose, Urea, Hexyl Nicotinate, Dextrin, Citric Acid, Polysorbate 20, Gellan Gum, Trisodium Ethylenediamine Disuccinate, Sodium Chloride, Hexylene Glycol, Potassium Sorbate, Sodium Benzoate, 1,2-Hexanediol, Caprylyl Glycol. Salicylic Acid 2% Solution This is best when used on small areas that get congested or spot treatment as opposed to the whole face because witch hazel water can be drying and its a basic formula. This is a fragrance free serum/gel texture, but use a tiny amount otherwise it can stay tacky. pH 3.6 Aqua (Water), Hamamelis Virginiana Leaf Water, Cocamidopropyl Dimethylamine, Salicylic Acid, Dimethyl Isosorbide, Trisodium Ethylenediamine Disuccinate, Citric Acid, Polysorbate 20, Hydroxyethylcellulose, Ethoxydiglycol, Potassium Sorbate, Sodium Benzoate, 1,2-hexanediol, Caprylyl Glycol. Azelaic Acid Suspension 10% It's hard to find over the counter products with Azelaic acid, so I liked seeing this being offered among the acid range. This texture is a gel cream and dries to a soft texture with a similar feel of a makeup primer. This is another product I would apply in affected areas instead of the whole face. Perfect for sensitive acne skin types who need something gentler or different than benzoyl peroxide or for areas of rosacea. pH 4.7 Aqua (Water), Isodecyl Neopentanoate, Dimethicone, Azelaic Acid, Dimethicone/Bis-Isobutyl PPG-20 Crosspolymer, Dimethyl Isosorbide, Hydroxyethyl Acrylate/Sodium Acryloyldimethyl Taurate Copolymer, Polysilicone-11, Isohexadecane, Tocopherol, Trisodium Ethylenediamine Disuccinate, Isoceteth-20, Polysorbate 60, Triethanolamine, Ethoxydiglycol, Phenoxyethanol, Chlorphenesin. Lactic Acid 5% + HA and Lactic Acid 10% + HA. The ingredient list for both formulas are almost identical, with one being 5% Lactic and the other having 10% Lactic. This fragrance-free non-sticky combo of lactic acid, an anti-irritant, humectants, and sodium hyaluronate is ideal for dry skin. Start with the 5%, but if you have rough texture areas you may need to bump up to the 10% formula. pH 4 Aqua (Water), Lactic Acid, Glycerin, Pentylene Glycol, Propanediol, Sodium Hyaluronate Crosspolymer, Tasmannia Lanceolata Fruit/Leaf Extract, Hydroxyethylcellulose, Isoceteth-20, Trisodium Ethylenediamine Disuccinate, Sodium Hydroxide, Ethylhexylglycerin, 1,2-Hexanediol, Caprylyl Glycol. AHA 30% + BHA 2% Peeling Solution. This is one of the best at home peeling solutions out there with a combo of 30% AHA (Glycolic/Lactic/Tartaric/Citric) + 2% BHA plus the addition of aloe, hyaluronic acid, and anti-irritants. I recommend weekly (or every other week) peels like this one if you don't use acids regularly. This is great for sun-damaged skin, rough textures, and for fading acne marks. pH 3.6 Glycolic Acid, Aqua (Water), Aloe Barbadensis Leaf Water, Sodium Hydroxide, Daucus Carota Sativa Extract, Propanediol, Cocamidopropyl Dimethylamine, Salicylic Acid, Potassium Citrate, Lactic Acid, Tartaric Acid, Citric Acid, Panthenol, Sodium Hyaluronate Crosspolymer, Tasmannia Lanceolata Fruit/Leaf Extract, Glycerin, Pentylene Glycol, Xanthan gum, Polysorbate 20, Trisodium Ethylenediamine Disuccinate, Potassium Sorbate, Sodium Benzoate, Ethylhexylglycerin, 1,2-Hexanediol, Caprylyl Glycol.